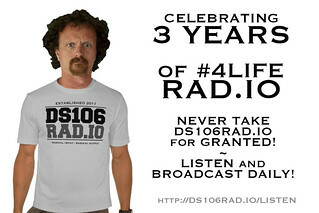 TDC745: "On January 23, 2011, Grant Potter announced the birth of ds106 Radio. Design a card for its 3rd Birthday." Given that it is our dear Grant Potter who keeps the ice weasels fed up in the Hudson Bay Hut where our signal originates (at least some of the time), who better to thank on this occasion of occasions, but Grant? I borrowed Grant's likeness (again) from this great photo of Grant and Jason by cog dog. For a little more entertainment, check out the related post and obligatory animated GIFs on my de•tri•tis blog. 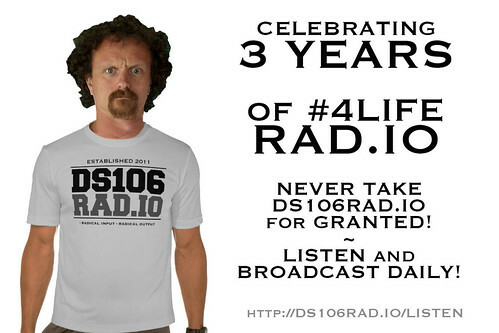 And if you are so inclined, you can even arrange to get your own celebratory 3rd anniversary ds106rad.io shirt, just like Grant is wearing!